Four seconds. That’s all I would have had to find somewhere on the Vancouver Marathon course to beat my personal best of 4:18:25 for the full marathon. Dammit. Still, I did cut a generous 19 minutes 26 seconds off of last year’s time. This was the first marathon I’ve run on my own (my wife also ran but she’s a lot quicker than I am and started in a different wave) so I was looking forward to seeing how I fared without anyone else running alongside me. It was a grey, wet day which was actually a lot better than last year when it was fairly warm. It did make the choice of clothing difficult until I remembered I had a very light running waistcoat thingy that I bought at the 2010 Victoria Marathon and have barely worn so I went with that and a short sleeved running shirt. It turned out to be a wise choice, it drizzled most of the race and in places it was pretty cold. The climb up Burrard Bridge was particularly gruesome. Overall the race was good but I decided to try for a four hour pace and it cost me at the end. I hit the halfway mark just under 2 hours and was on track until about 10km to go. 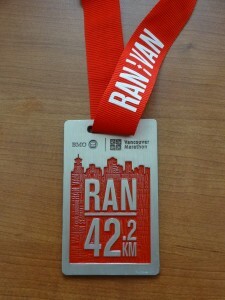 As marathon runners will tell you, that’s the point you hit the wall and the last 10km round the Vancouver seawall is – as one of the other runners commented to me as we shuffled along – “really tough.” The only upside is it’s flat. If I’d targetted a 4:10 pace I’d probably have hit it okay. Still – no risk, no reward. Here’s the data from my Garmin GPS watch. The first graph is heart rate and pace by distance, the second is heart rate and pace by time (click for bigger versions). You can clearly see the walk breaks (that’s where the red line drops downwards). In the second graph, you can see how they get closer together as I drop back to walking pace more often the more tired I get. You can also see my bathroom break at the 18km mark. Not only did I go for a slightly too ambitious pace, I also completely screwed up my nutrition. As usual. Based on the tests I’ve done at the Peak Centre I need to eat about 1g of carbohydrate per minute. That’s a couple of Stinger energy chews every ten minutes which fits in well with my normal run 10 minutes, walk 1 minute pacing strategy. There’s a saying in marathon running – “Nothing new on race day.” You don’t choose race day to wear brand new shoes or a brand new shirt or try eating a curry for your race day breakfast for the first time. Of course, I decided to completely ignore that and walk through the water stations which are roughly 2.5km apart. That’s more like a run 15 minutes, walk 1 minute strategy. Which meant I wasn’t eating enough carbs. It wouldn’t have mattered though because as I got more tired I started skipping my chews completely. I just didn’t feel like eating anything. Nor did I drink all the coconut water I was carrying. The offshoot of that nutritional neglect was that by the end of the race I hadn’t eaten even half of what I was supposed to. That was probably a big part of why I “bonked” so hard in that last 10km. Nutrition is my Achilles heal and for the next race (the Banff Marathon on June 22nd) I’ll be making a concerted effort to work on sticking to both the timing and nutrition strategy I use during training. I made it to the end though, and as you can see from the graphs I pushed up the hill to the finish. I then walked very slowly through the finish area, grabbed my post-race snacks and found my wife who’d completed the race in 3:42:47 and in the process qualified for next year’s Boston Marathon. We managed to get inside a building to recover but it was very cold and we both felt pretty rough so we got a cab home as quickly as we could. Never mind, I’ve just registered for next year’s race so I can try again.